Microgaming has unleashed its Exotic Cats online slot on the world, fittingly enough on International Cat Day. The slot hit UK casino sites on 8th August, the day people around the world celebrate the feline form. These aren’t your usual tabby cats though, this online slot game features some of the most ferocious beast in the animal kingdom. Exotic Cats is a five-reel, 243 ways to win video slot, set in front of a jungle background. Five magnificent mammals guard their reels with vigour, occasionally swiping their claws and adding in vertical Wilds offering fantastic opportunities to win. Find out more about the Exotic Cats online slot in this article. Discover how to play, where to play and what to expect from this new Microgaming slot game. What is it Like to Play Exotic Cats Online Slot? When you launch Exotic Cats, you are transported to the depths of the jungle. It looks beautiful, with vine leaves twisting around the canopy and lush undergrowth providing the background for this new slot game. The ribbits and calls of the other jungle animals make this an atmospheric experience all round, but it really springs into life when you spin the reels and the jungle drums kick in. Each of the five reels has an exotic cat looking after proceedings. Lion, tiger, panther, leopard and cougar occasionally pop up above the reel that bears their name to make sure that all is running smoothly. If you are really lucky, one of the big cats leaps over and claws at their reel, turning it into a vertical Wild. This potentially helps complete numerous winlines, bringing in some sweet prizes. So, don’t fear the sharp teeth and talons, they could be your route to success! Before you can play the Exotic Cats online slot, you need to find a casino that stocks it. It is a very new game, but many Microgaming casinos refresh very quickly with the latest titles. One of the first UK casino sites to offer Exotic Cats is Mr Green Casino. Simply hit the link below to visit Mr Green and sign up for a casino account. Verify your registration by replying to the email sent by the site, and then fund your account in the deposits section. After that, hit the lobby and launch Exotic Cats. Set your bet level, between 15p and £30, and spin the reels. As they spin, you’ll notice symbols including various jewels, paw prints, the big cats themselves and a mysterious woman. 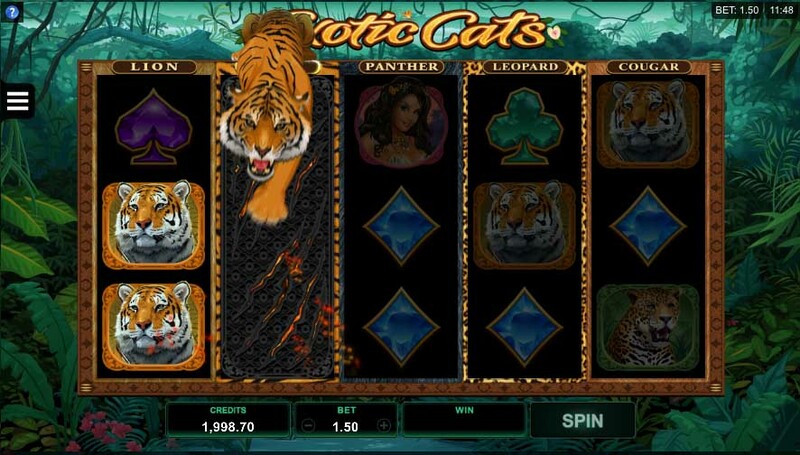 Although Exotic Cats is a fairly simple online slot, there are some really tasty features. Take a look at the exciting bonuses and games you can indulge in on this game. The Exotic Cats logo is the regular Wild, which substitutes for everything but the Scatter. It can complete wins and bring in additional cash. The vertical Wilds are a sweet addition to this slot. If a particular cat symbol lands on the reel guarded by that same animal, the whole reel turns Wild. The cat at the top of the reel leans over and ferociously claws at the reel, leaving its mark on both the reel and, hopefully, your bank roll. With three symbols Wild rather than just one, you are three times more likely to benefit from this. More than one reel can become a vertical Wild at the same time and if all five cats turned up on the correct reels, it’s even possible that all five reels could become vertical Wilds! Imagine the excitement you would feel if that happened to you! When you land three Scatter symbols across the reels, you enter the Free Spins round. The initial offering is ten bonus rounds, with the chance to add five more by spinning another three or more Scatters. The vertical Wilds feature still comes into play in the Free Spins bonus round, meaning there’s a great chance of loading up your bank roll without having to spend cash on spins! Why Should I Play Exotic Cats? The Exotic Cats online slot is a neat, simple game. There’s no complicated plot or mission to go on, but just a solid video slot experience. The bonuses are great, particularly the vertical Wilds. The animation works beautifully and you really get an idea of the power of these animals as they claw the reels and turn them Wild. The audio and visuals add to the joy of the game, which will keep you entertained for a while. There is a jackpot of 500 coins, but you can technically pick up a total of 3,533 times your stake if the symbols fall kindly for you. Get on to Mr Green Casino now to play! Microgaming is an industry leading games developer. Based on the Isle of Man, it is responsible for some of the most iconic titles in online slots history. It is known for its big movie tie-ins, including Jurassic Park and Jurassic World, both of which feature clips from the iconic films. Immortal Romance is a vampire-related favourite from Microgaming. Taking its cue from Buffy, Twilight and other teen vampire classics, this is a moody and emotional game that will entrance you. In addition, the Thunderstruck games are some of the best known games to be inspired by Norse mythology. There are so many games that have also placed themselves in this field, but Thunderstruck II is still the high water mark. Take a look at the Microgaming section of SpinCazino to find out more about this giant of the gaming world.